Police Militarization: Is It Out of Control? Are the police waging war in our neighborhoods? The militarizing of the police in response to protestors, in the aftermath of the police shooting death of Michael Brown in Ferguson, Missouri, has many asking this question. As tension mounts in the Ferguson community, the practice of shifting military equipment to police departments has led to a surge in scrutiny by lawmakers. All over this country, local police departments are being armed with military grade weapons and equipment by the Department of Defense. In 1997, Congress enacted the 1033 program that expanded the practice of distributing extra military gear and allowing the reassignment of military equipment to local law enforcement. The 1033 program was established by Congress due to concerns of being “outgunned by drug criminals.” Additionally, the Department of Homeland Security has provided funding for arms through “terrorism grants” in excess of $34 billion for items such as surveillance drones and an Army tank. The overarching purpose was to keep the police and communities safe from both armed drug groups and terrorist events. However, there are many who argue that there has been excessive use of the military equipment by police departments across the country. An ACLU year-long report found that policing has become both “excessively militarized” and has “occurred with almost no oversight.” The report states that over 800 paramilitary raids were studied, and nearly 80 percent related to “ordinary law enforcement purposes” such as serving search warrants on homes. In contrast, only 7 percent were for legitimate emergencies, such as a “barricade or hostage situation.” Further, the report found that due to the way the war on drugs targets colored communities, that people of color have a higher probability of being affected by such paramilitary raids. Several lawmakers from both parties have come out with “stern condemnations” of the “military-style weaponry” response in Ferguson and plan to “do something about it.” The Senate Armed Services Committee Chairman Carl Levin stated that the Senate plans to “review” the Defense Department program. Senator Claire McCaskill, another committee member, is also reviewing the program and is working with Representative Hank Johnson to introduce a bill to end the reassigning of military weapons to law enforcement agencies. 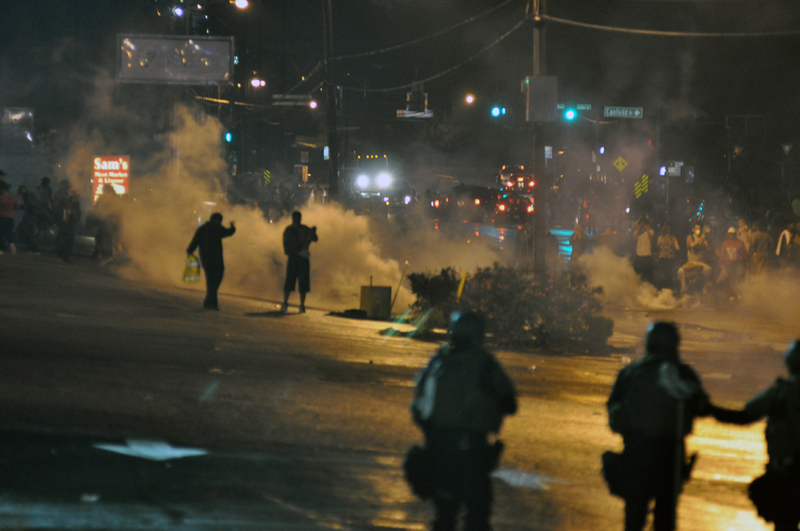 Others such as Senator Rand Paul and Senator Patrick Leahy have also been critical of the military type response in Ferguson. Leahy has stated “equipping police officers with the tools of war does nothing to repair a torn community.” However, it is not clear how much support there actually is in Congress right now for the repeal or revision of the program. Similarly, there have been veteran law enforcement officials from some of America’s largest police forces who have come out against the militarization of local police. Norman Stamper, who was the former Seattle police chief, wrote that he regretted the use of “military-style tactics” that were employed against demonstrators of the 1999 World Trade Organization conference held in Seattle. The former chief now believes that the correct approach should include “an authentic partnership in policing the city,” including officers, civilian employees, and representatives from the community. In a recent statement, Attorney General Eric Holder emphasized the need to use other alternatives such as the Department of Justice’s Community Oriented Policing Services , and not police militarization as a first response to violence. Still others, such as police Chief Jerry Wilson, have argued that the military tactics are more harmful then helpful. Wilson stated that “an intimidating police presence didn’t prevent confrontation, it invited it.” He further noted that while you should be prepared to respond with “riot-control teams,” they should be nearby but “out of sight of protestors.” Additionally, Major Max Geron of the Dallas Police Department explains that police who interact with protestors should come to terms with them as to what is allowable and unallowable. In addition, training has not been required by the government in many instances where police departments have received military equipment. It appears that the militarization of the police has not been used for its intended purpose but for situations that require a more diplomatic approach. As it has played out recently in Ferguson, the military-style tactics implemented by law enforcement toward a community that is already distrusting of the police only serves to incite as opposed to quell tensions. Instead, law enforcement should attempt to establish some level of trust with the local community.Working with community leaders in order to resolve differences should be the first order of business. The need for military arms and equipment should only be used for their intended purpose such as to deal with dangerous drug raids and terrorist incidents. While law enforcement officials should be prepared in situations where riots may occur, they should not initiate an aggressive stance with their local communities when such actions are not yet justified. Additionally, there should be mandatory training for all police departments that receive military grade gear. The training should include a discussion on the limitations of their use. Police actions that include the use of military-style tactics and equipment should be reviewed periodically with violators losing privileges of their use.